The Barcelona Chair is undoubtedly one of the symbols of 20th century modernism, setting a new standard in furniture design for decades to come. Its design embodies both of its creator’s famous credos: “Less is more” and “God is in the details”. The design was refined down to essentials making the form of the chair very minimalistic and pure. The chair consists of three main components: a stainless steel frame and two tufted leather cushions. The frame comprises two x-shaped sections, which serve as the chair’s legs and supports for the cushions. Its unique x-shape is achieved through the use of curved, steel stripes which are welded at the point of their intersection. The welds are grinded and buffed, giving the frame a smoother appearance and making it look like a single, seamless piece of metal. The cushions are manufactured from bovine leather. After being cut into square sections, the leather is tufted and welted together into rectangular cushions and laid on leather stripes riveted to the chair’s frame. The overall appearance of the chair is extraordinarily appealing and stylish. It is very proportional and well-balanced and the use of the frame makes it look both airy and light. In contrast to fully-upholstered furniture, it does not obstruct the room in which it is placed but enhances the perception of spaciousness. Even today, almost nine decades after its presentation, when modernism is not an extravagant or radical concept anymore, the Barcelona Chair has neither aged nor become trite. It still looks fresh and contemporary. 1929, the German pavilion at the International Exhibition in Barcelona. The futuristic structure of glass, steel and marble, soon to become a benchmark for modern architecture, was the place where the King of Spain Alfonso XIII would open the German section of the exhibition. The pavilion contained two extraordinary chairs and a couple of matching stools - which together would lay the foundation for the famous Barcelona furniture collection. The design of the Barcelona Collection, as well as the pavilion itself, was conceived by Ludwig Mies van der Rohe – the legendary modernist and an iconic figure of 20th century architecture and design, who abandoned the idea of ornamental, bourgeois forms in favour of elegant simplicity. The origins of the furniture designs can be dated back to the beginning of the Modern Movement. In contrast to the historic trend of incorporating the past in furniture design, this era was defined by the idea of making timeless, universal objects that would resist the passage of time. This belief led to more simple, pure designs that were less prone to becoming obsolete. The concept of the simplified design was later developed by the Bauhaus, with which Mies van der Rohe was closely associated. The main principle of the Bauhaus was to make everyday mass-produced objects beautiful yet practical and still attainable by ordinary people. The idea of making very simple and fully functional, yet elegant and stylish objects has been present in the design of Barcelona Collection furniture from the very beginning. In fact, such furniture was not only put on display but the two chairs were meant to provide comfortable seating for the king and queen of Spain during the opening ceremony of the exhibition. 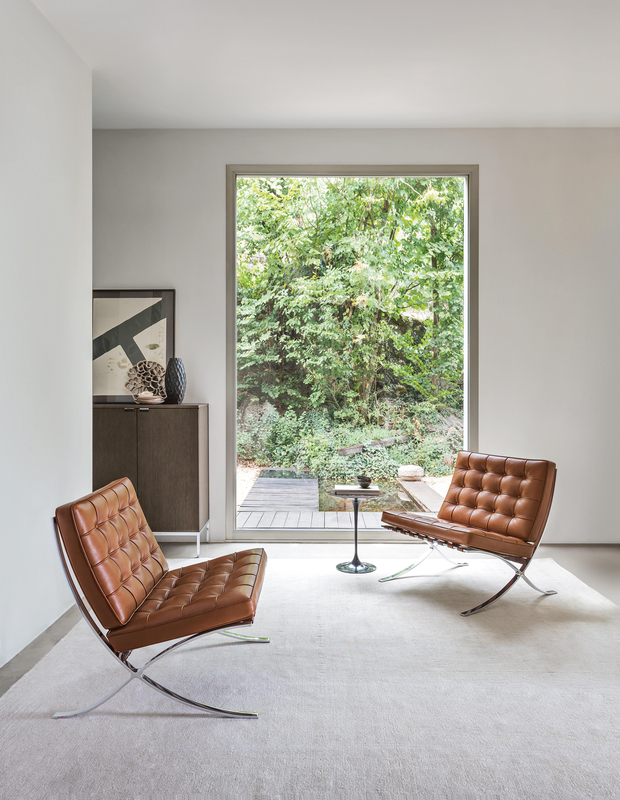 While the design of the Barcelona Chair is usually attributed to Mies van der Rohe, it is worth noting that another great German designer - Lilly Reich - also contributed to its design. To the untrained eye, the original pair of chairs from the 1929 Barcelona exhibition may look identical to the chairs being produced today. Yet numerous changes have been implemented throughout the years. The original cushions were made from pig leather while they are currently produced from cowhide. Another change is related to the frame. It was originally chrome-coated and joined by bolts but is now being produced as a stainless steel, seamless frame. Reflecting on the final product, Ludwig Mies van der Rohe reportedly said: “I have designed a chair fit for the king to sit on.” However, neither the King of Spain nor his wife ever sat on it. Even though one of the underlying principles of the Bauhaus, in which the Barcelona Chair has its roots, is the availability for the ordinary people, the price of the chair is excessive. It is priced around $6000, making the chair a truly regal item, available only to the wealthiest. In 1977, the Barcelona Chair was honoured with the Museum of Modern Art Award. Mies van der Rohe based the Barcelona Chair’s design on the campaign and folding chairs used in Ancient Egypt and the Roman Empire, thus making one of the oldest designs the symbol of modernism. The chair can be seen in a multitude of cinematic productions, including: American Psycho, In Bruges, Casino Royal, Iron Man 2, Old Boy, Silent Hill, A Star is Born and Down with Love.